Materials Today meets researchers from New Zealand and Australia who are making waves in the world of materials science. Julie Cairney is a Professor of Engineering at the University of Sydney and serves as Director of the university core facility, the Australian Centre for Microscopy & Microanalysis. 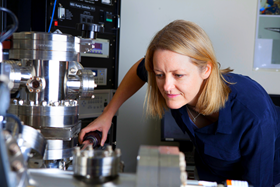 She is also the CEO of the Australian Microscopy & Microanalysis Research Facility. Prof Cairney leads a research group that focuses on the relationship between microstructure and properties of materials, with particular emphasis on the application and development of new microscopy techniques. She is the author of over 170 publications, has been cited 2000+ times, and has published a book on atom probe microscopy. Prof Cairney serves on the Australian Research Council College of Experts and the New Zealand Marsden Fund. She is an advisory board member for the journal Ultramicroscopy and has been elected to the Steering Committee of the International Field Emission Society. She is one of the youngest full professors at the University of Sydney, and one of only a handful of female professors of engineering in NSW. Laurie Winkless spoke to Prof Cairney about her background, her research, and her approach to collaboration. I grew up in the outback of Australia, in a mining town called Broken Hill, a fifteen hour drive from Sydney. It was a great place to live because, although it was small, it was filled with engineers and scientists, and had theatre, a cinema etc. l was good at maths and science at school, so I always knew I wanted to go on to study something ‘sciencey’. Then, a local company gave me a scholarship that would support me to study a mining-related subject at university. And that was really when I first came across the Materials Engineering course at the University of New South Wales. I remember seeing subjects like crystallography and x-ray diffraction on the curriculum, and thinking, ‘ooh that sounds cool’. I’m not sure I was particularly strategic or thoughtful about my choice of degree – I just went with what looked interesting! I was very excited to be in Sydney – I lived in a college with a whole bunch of other young people and it was a lot of fun. The course was fine, and I did well, but it was really only in the final year that I fell in love with science. I did a research project on a transmission electron microscope (TEM) around intermetallic alloys, and I don't think I’ve ever worked so hard on anything in my life. When you do assignments, you have a clear end goal and, if in doubt, you’ll find the answers in the back of the textbook. But in research, there’s no end point, and you’re asking questions that might never have been answered. I became a bit obsessed with it – I just kept going, digging deeper and deeper. It was almost like research was a calling for me. So, when my supervisor offered me the opportunity to do a PhD, I jumped at it. What did your post-grad studies involve? I stayed at UNSW for my PhD, working under Prof Paul Munroe, who at the time was the Director of the university’s Electron Microscope Unit. I was using what was a relatively new microscopy technique at the time – focused ion beam (FIB) – to make TEM samples of metal-matrix composites. I then investigated any artefacts to understand whether samples produced in that way were truly representative of the material. FIB is such a standard technique now that I sometimes think of my thesis as obsolete. But I know that those studies really helped to establish the body of knowledge for FIB. My most significant contribution was probably around the interpretation of the data and images of FIB samples. It was so new back then that everyone wanted to get involved. Now, FIB is an incredibly valuable research tool, in use all over the world! I admit though that, towards the end of my PhD, I had a moment of doubt. I was sent to a conference in the US, and found myself surrounded by incredibly confident PhD students, and genius keynote speakers. I found myself wondering if I was ‘cut out’ for academia. But, I looked around at the others in the audience, rather than the ‘superstars’ and decided to stick with it. Of course now I realize that I’m perfectly capable, but yes, academia can be a bit intimidating when you're young! Anyway, in 2002, I was granted a Royal Academy of Engineering Research Fellowship, which allowed me to work with a fantastic microscopist - Prof Ian Jones at the University of Birmingham - for 18 months. At the end of that, I was awarded a three-year Vice Chancellor Fellowship, so I returned to UNSW to work with Prof. Mark Hoffman. That fellowship was independent, which gave me the opportunity to travel. I spent six months at the Max Planck Institute in Stuttgart, working with a legend of microscopy, Prof Manfred Rühle. I still collaborate with people I met there! I also spent some time in Japan working on the wear properties of thin films. By that point, I knew I wanted to stay in Australia, but I didn’t really have a ‘grand plan’. I took one more postdoc position at the University of Sydney, which eventually led to the job I have now. I actually have a few different roles – my main one is as the Director of the University of Sydney’s core microscopy and microanalysis facility. I manage twenty staff and a very large portfolio of advanced microscopes. I’m also the CEO of the Australian Microscopy & Microanalysis Research Facility, which is a national microscope user facility. The government funds us to make eight labs across Australia openly accessible to any researcher. Because all researchers can access all microscopes, we can be strategic about what we invest in rather than compete, and I’m proud of the fact that our infrastructure is available to everyone who needs it, no matter what type of research environment they come from. Those two roles keep me pretty busy, but then I also have my research group! We work on atomic scale characterization of materials using different microscopy techniques, but I’m maybe best known for my work in atom probe tomography. This technique involves firing a laser at a needle-shaped sample, which allows us to pluck off all of the atoms one by one. We can then use time-of-flight to work out what type of atom they are, and then by looking at their position on the detector to back-calculate its position in the needle. This allows us to construct beautiful, quantitative, 3D maps of the arrangement of atoms within materials – it’s very cool. Do you enjoy collaborating with other researchers? Of course – collaboration is absolutely key when you are a characterization person. And the fact that we’re in Australia really hasn’t hindered us at all. Over the years, we’ve collaborated with in the range of 30 research groups all over the world. The atom probe work in particular has opened lots of doors. I originally started off just using it for metals, but we’ve used it to explore everything from thermoelectric materials to human tooth enamel! I did a very fun project with some geologists from Macquarie University who were dating zircons in rocks, using uranium-lead (U-Pb) dating. When zircons solidify during rock formation, they lock uranium into their structure, but reject lead. So, any lead found in the zircon must have been formed by the radioactive decay of uranium. By measuring the U-Pb ratios, you can date the rock. This technique is really widely used, but it can give weird results for zircons that have been heavily deformed. They came to us with pieces of zircon, which we studied under the atom probe. Ultimately, we were able to show that lead can diffuse along dislocations in heavily-deformed zircons, through a process called pipe diffusion, and that it would be enough to produce contradictory U-Pb dating results. As a metallurgist, you spend your whole life studying how different combinations of heat and deformation affects microstructures. These geologists were interested in exactly the same thing, only their materials had been experienced these effects over billions of years. To be able to use our experience and our characterisation tools to examine the samples, and confirm exactly what processes they went through, well, it was amazing. And the results just blew their mind. It’s always a thrill to work right at the cutting edge of research. We’re currently putting together a proposal to build a cryo-atom probe system here. With that we could look at vitrified (glass-like) samples, and we may even be able to look at how atoms interact within proteins. Honestly, there is so much world-class materials science being done in Australia, and I love being a part of it!